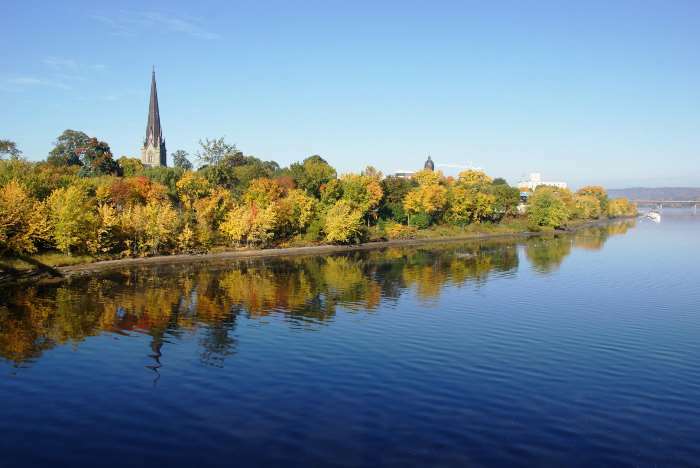 Fredericton is New Brunswick’s capitol, and it’s a picture-perfect example of a beautiful Maritime Canada small city. It’s well worth your time to take a stroll around downtown and check out the waterfront — and the pedestrian bridge. Fredericton is located in south-central New Brunswick, along the Trans Canada Highway (Route 2). It’s about an hour to the Bay of Fundy coast, an hour to the United States border, and a little over two hours to Nova Scotia. I’ll start with a nice picture of Fredericton, on the banks of the Saint John River. I didn’t think I’d get a picture this crisp and clear, because when I started my exploration, downtown was in a fog. My hotel wasn’t, but when I drove towards the river, I was swamped by the soupy, damp air. Most of downtown is lined up along King, Queen, and Brunswick Streets. I parked along Queen Street and walked into Officers’ Square. 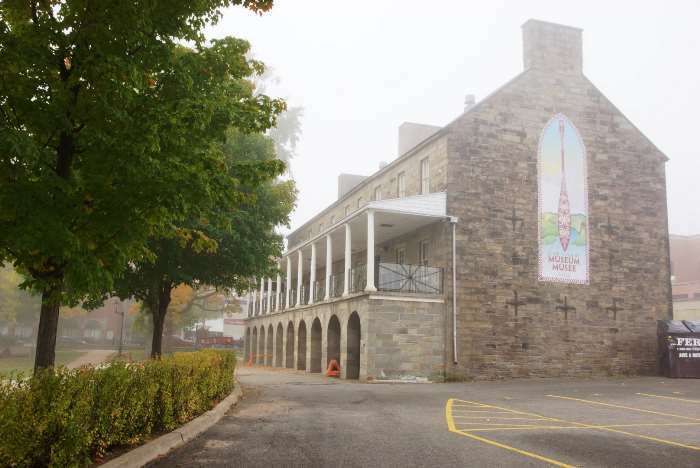 From the late 1700’s into the mid-1800’s, the British Army was stationed here, and then in the late 1800’s and early 1900’s, the Canadian Army used this space. Now, it’s a wide-open public space, used for concerts and events. 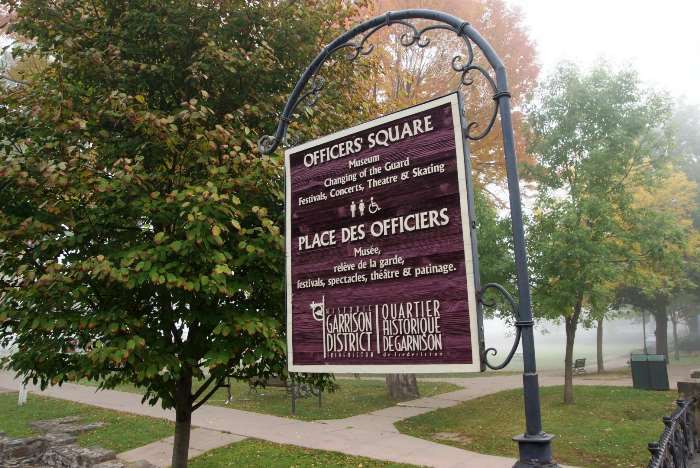 On one side of the square, you’ll find the Officers Quarters — a home for the British (and later Canadian) Officers while stationed in Fredericton. The building was constructed in phases over several decades, with the work complete in 1853. 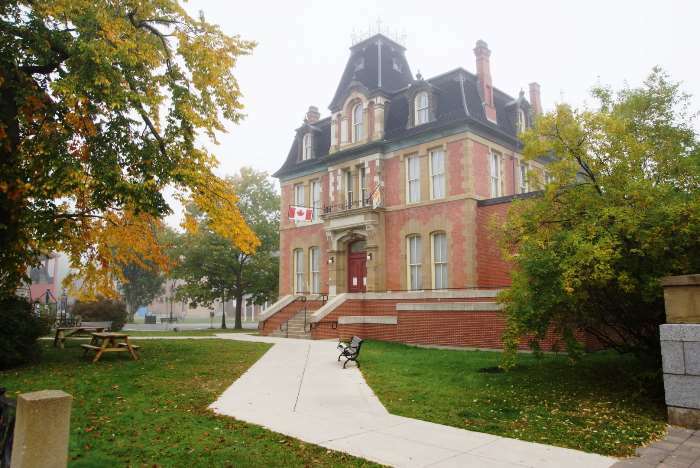 Also on the square, you’ll find the old Post Office and Customs House. This impressive Second-Empire-style building still displays iron lacework on its central tower. The building was completed in 1881. Currently, it’s home to the New Brunswick Sports Hall of Fame. 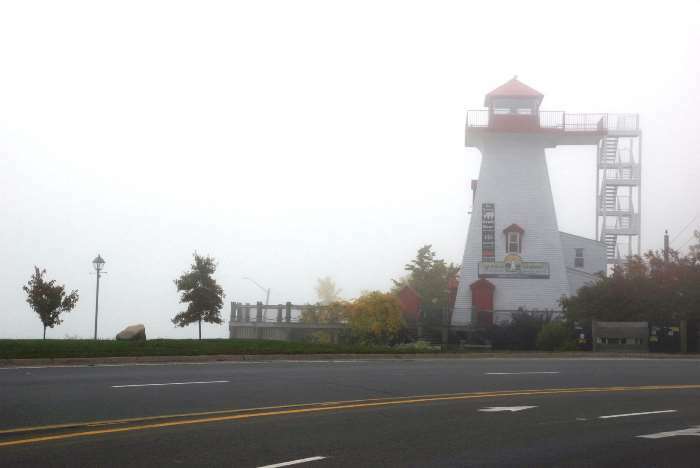 For a better view of the city, you can head over to Fredericton’s Lighthouse on the Green. It’s not quite as historic as other New Brunswick lighthouses — it’s only been around for a couple of decades. But, you can still enjoy a view by paying a $2 admission fee, then heading up to the top of the lighthouse for a look around town. The lighthouse had already closed for the season when I visited in October, but I doubt that the view would have been very good in all that fog! Now, about that shot of the river and skyline at the top of the page — you can get that shot by going for a walk over the Bill Thorpe Walking Bridge. 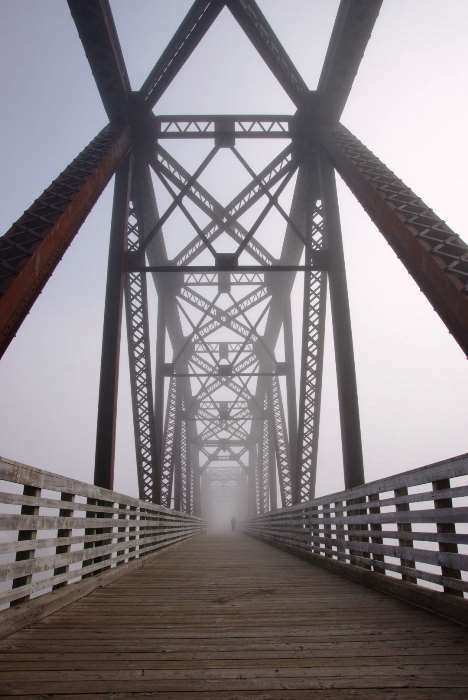 The old railway bridge was re-purposed in 1997 for use by pedestrians. I’ll tell you much more about it on the next page. It’s well worth your time to take a stroll around downtown Fredericton, and learn about its history. Make sure you take a walk across the bridge, too.